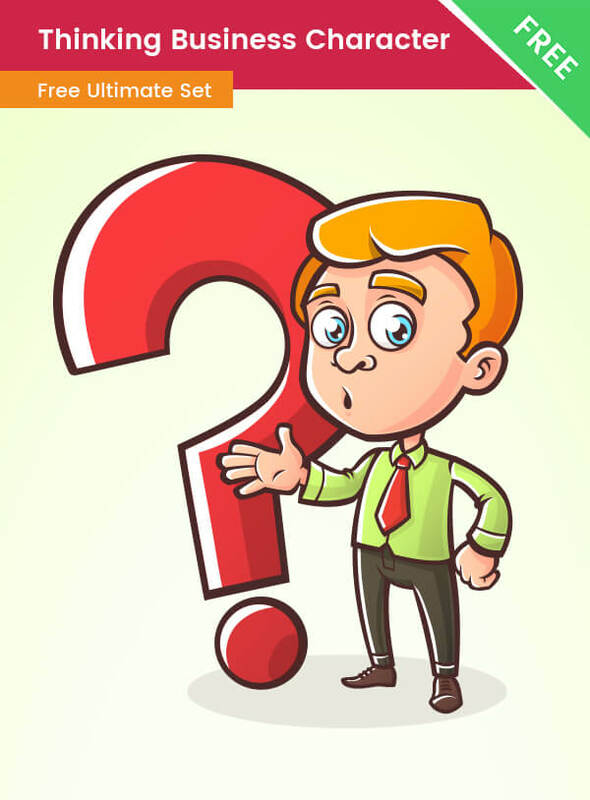 A thinking businessman character made in a modern cartoon style This cartoon businessman is perfect for any modern design and he will definitely grab the attention of your visitors. If you need to illustrate a question or wondering, this character is perfect for this purpose. We’ve made him in a modern flat cartoon illustration style. He has a nice green shirt and a red tie, has blonde hair, and wondering standing to a question sign. He is made of vector shapes, so you can modify the colors if you want to. You can also scale the character up as you want without losing quality as you would with raster graphics. Anyway, if you are not familiar with vector-based software, you can use the included transparent PNG file in the download .ZIP archive.